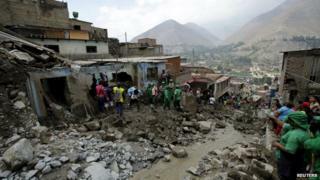 The Peruvian authorities have announced a state of emergency in a town which was hit by an avalanche of mud and rocks on Monday. A torrent of mud and water sent car-sized boulders crashing through the town of Chosica, 47 km (29 miles) from the capital Lima. At least seven people were killed and 65 houses destroyed. The country's main east-west highway was blocked and residents are asking for equipment to clear up debris. The boulders were loosened by two hours of heavy rain on Monday. Floodwaters smashed through brick walls and carried cars, animals and furniture through Chosica's streets. The state of emergency was called for 60 days to give powers to the local authorities to re-establish power and water supplies, and initiate a clean-up operation. Residents in the town have asked the authorities for diggers and heavy equipment. A 1967 mudslide in Chosica killed 64 people. Image caption Families who had lost relatives in the floods appealed for help.